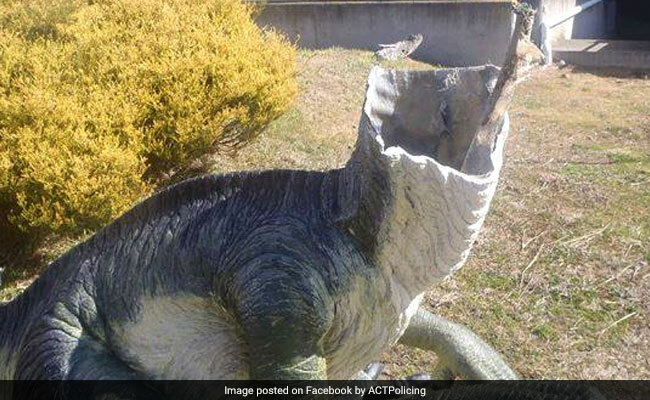 Investigators are hunting for the attackers after the damage to the dinosaurs, which were in an outside display area, took place late Saturday at the museum in Canberra, the police said. Sydney: Three model raptors at Australia's National Dinosaur Museum have been beheaded by mystery vandals who scaled a fence and removed the parts using an angle grinder or hacksaw, the Australian Capital Territory police said today. "The damage sustained to the (three velociraptor) dinosaurs indicate that an angle grinder or hacksaw was used to remove the heads from the body," they said. "The offenders had climbed a four-foot fence to gain entry." Museum staffer Mitchell Seymour said the damaged dinosaurs were first spotted by visitors, with children puzzled at what happened. "We went out to check it out and three of our dinosaurs here have been decapitated," Mr Seymour told the Australian Broadcasting Corporation. "It's selfish, and it's thoughtless is what it is." A giant fibreglass dinosaur was stolen from the museum in 2013 and later found in the home of a man who said it was taken as a birthday prank, ABC reported.